Wow, this was a tour de force. This book is something that I enjoyed. 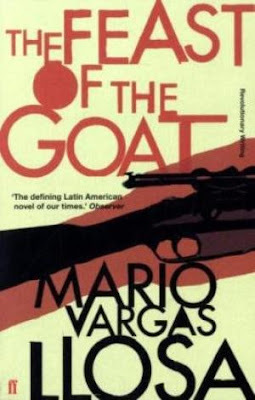 I have read works by Mario Vargas Llosa before, and sometimes I don't really get into his books, but other times I find myself mesmerized and couldn't put it down. So while I thought that Death in the Andes, Who Killed Palomino Molero, and The Green House were just okay, I thought that The War of the End of the World and The Bad Girl were amazing novels to the point that I wanted to pick another novel written by the same author. So what is this novel about? The Feast of the Goat is a historical novel about the dictatorship of Rafael Trujillo, a dictator of the Dominican Republic. The story is told from several perspectives: from the perspective of Trujillo himself, from the time when he wakes up in the morning to the evening of his assassination in 1961; from the perspective of Trujillo's assassins, as they plan the attack, to when they execute it, as well as the aftermath; and from the perspective of Urania Cabral, a 49-year-old woman who now lives in New York, who left the Dominican Republic when she was 14. Urania's father was a senator in Trujillo's government, who somehow fell into disgrace during the final years of the dictatorship. I must say that this novel was a page turner. First of all, I loved the fact that this novel allowed me to learn something new: I don't really know much about Caribbean history, let alone the history of the Dominican Republic. While this was a historical novel, which meant that there were plenty of fictional elements in it (the Cabral family for example was completely fictional); there were also plenty of historical figures and events that the story pulled together. For example, all the government figures as well as Trujillo's family were all true, and there were also plenty of events that actually happened, such as the assassination of the Mirabal sisters, and Trujillo's assassination attempt on Venezuelan president Romulo Betancourt. These were events that until I read the book I had no clue about, and I always liked it when whenever I would check Wikipedia I would see that these events actually happened. Reading this was also a very sobering issue: I never realized that a dictatorship could have existed in a Caribbean country like the Dominican Republic. And this makes me realize how human memory is such a short thing: these brutal events just happened in the 1960s, and nowadays we pretty much don't talk about it. And because we are not aware of it, chances are history would repeat itself, and who knows, another dictator might come up again. This brings me to my next point, that is, the Philippines. Indeed, the Philippines also had its dictator: Ferdinand Marcos. I do not know how brutal Marcos was, I just learned about him from history books. When he was around, I was just a toddler, and when he was toppled with a "peaceful" revolution, I was safely outside of the country, in Denver. Reading historical accounts of his rule make me think that when the Philippines got rid of him, it was a positive thing, yet nowadays you have people trying to revise history and even have a good impression of him. Heck, they even wanted to bury him in the Heroes Cemetery. And now, the Philippines has a new President. A new President who seems to have all the trappings of a dictator. I wonder what would happen six years later, when his term ends. Would he step down, or would he try to cling to power and install a puppet President that he would then control? Anyway, what I wanted to say is that this movie makes me think. I recommend it to people to read, as a warning, that power corrupts. Given what is happening in various parts of the world today, I think this novel conveys a powerful message that everyone of us should be aware of. I give this novel 5 out of 5 stars. If Odd reads it, I'd love to know what he thinks!